If your dog howls at your radio, he's not a weirdo. If your precious pooch has the frustrating habit of howling every time you attempt to enjoy a little music, he's not trying to sabotage your fun. He's just being a dog, and part of being a dog involves howling as a reaction not only to music, but also to other high-pitched noises. In howling along with music, not only is your pooch not attempting to bother your ears, he's not trying to show off his impressive soprano singing skills, either. The howling, however, may be traced back to your dog's wolf heritage. Wolves in the wild often "converse" with other members of their packs by howling. Not only is howling a means of gathering everyone into a single spot, it also can be a simple way for wolves to celebrate the oneness of the unit. Even if your dog has been living indoors with humans for his entire life, you can't always shake the wild instincts bestowed on him by his ancestors. Dog howling has a high-pitched and almost piercing quality to it. A lot of music also shares that quality, specifically pieces that involve pianos, saxophones and clarinets. High female singing can also encourage doggie howling. If your dog howls when he hears music with any of these elements, it may be because he -- mistakenly -- thinks that he is hearing another dog somewhere off in the distance calling out to him, and is attempting to acknowledge the communication by answering back loudly. "Low" instruments, such as bass guitars, can't confuse canines in the same manner -- they sound nothing like canine howling. Don't necessarily assume that your dog's howling has anything to do with the music you're playing. It may be mere coincidence. 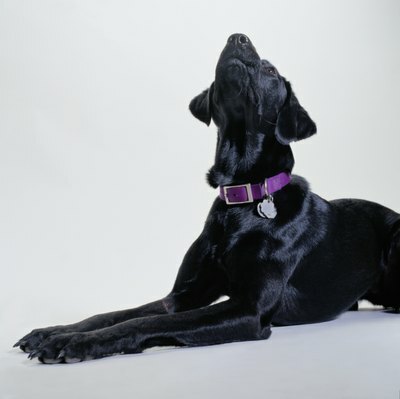 If the yowling continues well after you've turned off the classical music, it's time to investigate any and all of the other potential triggers for your dog's vocalization, whether nerves due to loneliness or physical pain. If you have any reason to think that your dog's howling is a result of pain or discomfort, then a veterinary appointment is calling out to your poor pooch. You may notice that dogs don't only howl back to music, but also to various other sounds that are high and shrill. Some examples are ambulance sirens, televisions and even certain high-pitched cell phone ringtones. As long as the sound is high and even vaguely similar to a canine howl, your poor pet may get confused. Pacific Rim Golden Retriever Club of Oregon Lewis & Bark Retrieve: Why Do Dogs Howl? "If Dogs Like to Swim, Why Don't They Like Baths?"